September | 2016 | VAMboozled! “A Concerned New Mexico Parent” sent me another blog entry for you all to help you all stay apprised of the ongoing “situation” in New Mexico with its New Mexico Public Education Department (NMPED). See “A Concerned New Mexico Parent’s” prior posts here, here, and here, but in this one (s)he writes a response to an editorial that was recently released in support of the newest version of New Mexico’s teacher evaluation system. The editorial was titled: “Teacher evals have evolved but tired criticisms of them have not,” and it was published in the Albuquerque Journal, as also written by the Albuquerque Journal Editorial Board themselves. The editorial seems to contain and promote many of the “talking points” provided by NMPED with their latest release of teacher evaluations. Hence, I would like to present a few observations on the editorial. NMPED and the Albuquerque Journal Editorial Board both underscore the point that teachers are still primarily being (and should primarily continue to be) evaluated on the basis of their own students’ test scores (i.e., using a value-added model (VAM)), but it is actually not that simple. Rather, the new statewide teacher evaluation formula is shown here on their website, with one notable difference being that the state’s “new system” now replaces the previously district-wide variations that produced 217 scoring categories for teachers (see here for details). Accordingly, it now appears that NMPED has kept the same 50% student achievement, 25% observations, and 25% multiple measures division as before. The “new” VAM, however, requires a minimum of three years of data for proper use. Without three years of data, NMPED is to use what it calls graduated considerations or “NMTEACH” steps to change the percentages used in the evaluation formulas by teacher type. A small footnote on the NMTEACH website devoted to teacher evaluations explains these graduated considerations whereby “Each category is weighted according to the amount of student achievement data available for the teacher. Improved student achievement is worth from 0% to 50%; classroom observations are worth 25% to 50%; planning, preparation and professionalism is worth 15% to 40%; and surveys and/or teacher attendance is worth 10%.” In other words student achievement represents between 0 and 50% of the total, observations comprise somewhere between 14% and 40% of the total, and teacher attendance comprises 10%. 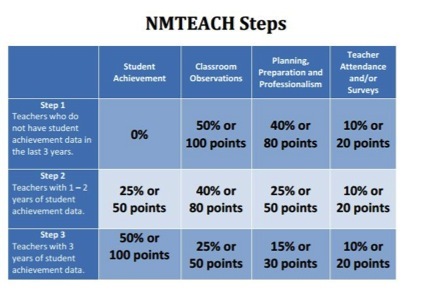 Also, the NMTEACH “Steps” provide for the use of one year of data (Step 2 is used for 1-2 years of data.) I do not see how NMPED can calculate “student improvement” based on just one year’s worth of data. Hence, this data substitution problem is likely massive. For example, for Category A teachers, 45 of the 58 formulas formerly used will require Step 1 substitutions. For Category B teachers, 112 of 117 prior formulas will require data substitution (Step 1), and all Category C teachers will require data substitution at the Step 1 level. The reason that this presents a huge data problem is that the state’s prior teacher evaluation system did not require the use of so much end-of-course (EOC) data, and so the tests were not given for three years. Simultaneously and for Group C teachers, NMPED also introduced an new evaluation assessment plus software called iStation that is also in its first year of use. Thus, for a typical Category B teacher, the evaluation will be based on 50% observation, 40% planning, preparation, and professionalism, and 10% on attendance. Amazingly, none of this relates to student achievement, and it looks identical to the former administrator-based teacher evaluation system! Such a “bait-and-switch” scheme will be occurring for most teachers in the state. Further, in a small case-study I performed on a local New Mexico school (here), I found that not one single teacher in a seven-year period had “good” data for three consecutive years. This also has major implications here given the state’s notorious issues with their data, data management, and the like. Notwithstanding, the Editorial Board also notes that “The evaluations consider only student improvement, not proficiency.” However, as noted above little actual student achievement is actually available for the strong majority of all teachers’ evaluation; hence, the rate by which this will actually count (versus perhaps appear to count to the public) are two very distinctively different things. Regardless, the Editorial Board thereafter proclaims that “The evaluations only rate teachers’ effect on their students over a school year…” Even the simple phrase “school year” is also problematic, however. August 2015: The student begins the fourth grade with teachers A1 and A2. March 2016: Seven months into the year the student is tested with test #1 at the 4th-grade level. August 2016: The student begins the fifth grade with teachers B1 and B2. March 2017: Seven months into the year the student is tested with test #2 at the 5th-grade level. To simplify, the test improvement is based on a test given before he has completed the grade level of interest with material taught by four teachers at two different grade levels over the span of one calendar year [this is something that is known in the literature as prior teachers’ residual effects]. I can only assume the Editorial Board members are brighter than I am because I cannot parse out the teacher evaluation values for my sample student. Nevertheless, the Editorial Board also gushes with praise regarding the use of teacher attendance as an evaluation tool. This is just morally wrong. Leave is not “granted” to teachers by some benevolent overlord. It is earned and is part of the union contract between teachers and the state. Imagine a job where you are told that you have two weeks vacation time but, of course, you can only take two days of it or you might be fired. Absurd, right? Well, apparently not if you are NMPED. This is one of the major issues in the ongoing lawsuit, where as I recall, one of the plaintiffs was penalized for taking time off for the apparently frivolous task of cancer treatment! NMPED should be ashamed of themselves! The Editorial Board also praises the new, “no lag time” aspect of the evaluation system. In the past, teacher evaluations were presented at the end of the school year before student scores were available. Now that the evaluations depend upon student scores, the evaluations appear early in the next school year. As noted in the timeline above, the lag time is still present contrary to what they assert. Further, these evaluations now come mid-term after the school-year has started and teacher assignments have been made. The evals have not evolved but have rather devolved to something virtually identical to the former observation and administration-based evaluations. The tired criticisms are tired precisely because they have never been adequately answered by NMPED. I recently heard about a new book that was written by Mark Paige — J.D. and Ph.D., assistant professor of public policy at the University of Massachusetts-Dartmouth, and a former school law attorney — and published by Rowman & Littlefield. The book is about, as per the secondary part of its title “Understanding Value-Added Models [VAMs] in the Law of Teacher Evaluation.” See more on this book, including information about how to purchase it, for those of you who might be interested in reading more, here, and also via Amazon here. Clearly, this book is to prove very relevant given the ongoing court cases across the country (see a prior post on these cases here) regarding teachers and the systems being used to evaluate them when especially (or extremely) reliant upon VAM-based estimates for consequential decision-making purposes (e.g., teacher tenure, pay, and termination). While I have not yet read the book, I just ordered my copy the other day. I suggest you do the same, again, should you be interested in further or better understanding the federal and state law pertinent to these cases. Many of us have been following VAMs in legal circles. Several courts have faced the issue of VAMs as they relate to employment law matters. These cases have tested a chief selling point (pardon [or underscore] the business reference) of VAMs: that they will effectuate, for example, teacher termination with greater ease because nobody besides the advanced statisticians and econometricians can argue with their numbers derived. In other words, if a teacher’s VAM rating is bad, then the teacher must be bad. It’s to be as simple as that. How can a court deny that, reality? Of course, as we [should] already know, VAMs are anything but certain. Bluntly stated: VAMs are a statistical “hot mess.” The American Statistical Association, among many others, warned in no uncertain terms that VAMs cannot – and should not – be trusted to make significant employment decisions. Of course, that has not stopped many policymakers from a full-throated adoption of their use in employment and evaluation decisions. Talk about hubris. Accordingly, I recently completed this book, again, that focuses squarely at the intersection of VAMs and the law. Its full title is “Building a Better Teacher: Understanding Value-Added Models in the Law of Teacher Evaluation” Rowman & Littlefield, 2016). Again, I provide a direct link to the book along with its description here. To offer a bit of a sneak preview, thought, I draw many conclusions throughout the book, but one of two important take-aways is this: VAMs may actually complicate the effectuation of a teacher’s termination. Here’s one way: because VAMs are so statistically infirm, they invite plaintiff-side attorneys to attack any underlying negative decision based on these models. See, for example, Sheri Lederman’s recent New York State Supreme Court’s decision, here. [See also a related post in this blog here]. In other words, the evidence upon which districts or states rely to make significant decisions is untrustworthy (or arbitrary) and, therefore, so is any decision as based, even if in part, on VAMs. Thus, VAMs may actually strengthen a teacher’s case. This, of course, is quite apart from the fact that VAM use results in firing good teachers based on poor information, thereby contributing to the teacher shortages and lower morale (among many other parades of horribles) being reported across the nation, and now more than likely ever. Well, the NMPED is at it again. They just released the teacher evaluation results for the 2015-2016 school year. And, the report and media press releases are a something. Readers of this blog are familiar with my earlier documentation of the myriad varieties of scoring formulas used by New Mexico to evaluate its teachers. If I recall, I found something like 200 variations in scoring formulas [see his/her prior post on this here with an actual variation count at n=217]. However, a recent article published in the Albuquerque Journal indicates that, now according to the NMPED, “only three types of test scores are [being] used in the calculation: Partnership for Assessment of Readiness for College and Careers [PARCC], end-of-course exams, and the [state’s new] Istation literacy test.” [Recall from another article released last January that New Mexico’s Secretary of Education Hanna Skandera is also the head of the governing board for the PARCC test]. The new state-wide evaluation plan is also available in more detail here. Although I should also add that there has been no published notification of the radical changes in this plan. It was just simply and quietly posted on NMPED’s public website. Important to note, though, is that for Group B teachers (all levels), the many variations documented previously have all been replaced by end-of-course (EOC) exams. Also note that for Group A teachers (all levels) the percentage assigned to the PARCC test has been reduced from 50% to 35%. (Oh, how the mighty have fallen …). The remaining 15% of the Group A score is to be composed of EOC exam scores. There are only two small problems with this NMPED simplification. First, in many districts, no EOC exams were given to Group B teachers in the 2015-2016 school year, and none were given in the previous year either. Any EOC scores that might exist were from a solitary administration of EOC exams three years previously. Second, for Group A teachers whose scores formerly relied solely on the PARCC test for 50% of their score, no EOC exams were ever given. Thus, NMPED has replaced their policy of evaluating teachers on the basis of students they don’t teach to this new policy of evaluating teachers on the basis of tests they never administered! Within a recent post, I wrote about my recent “silence” explaining that, apparently, post the passage of federal government’s (January 1, 2016) passage of the Every Student Succeeds Act (ESSA) that no longer requires teachers to be evaluated by their student’s tests score using VAMs (see prior posts on this here and here), “crazy” VAM-related events have apparently subsided. While I noted in the post that this also did not mean that certain states and districts are not still drinking (and overdosing on) the VAM-based Kool-Aid, what I did not note is that the ways by which I get many of the stories I cover on this blog is via Google Alerts. This is where I have noticed a significant decline in VAM-related stories. Clearly, however, the news outlets often covered via Google Alerts don’t include district-level stories, so to cover these we must continue to rely on our followers (i.e., teachers, administrators, parents, students, school board members, etc.) to keep the stories coming. Coincidentally — Billy Townsend, who is running for a school board seat in Polk County, Florida (district size = 100K students) — sent me one such story. As an edublogger himself, he actually sent me three blog posts (see post #1, post #2, and post #3 listed by order of relevance) capturing what is happening in his district, again, as situated under the state of Florida’s ongoing, VAM-based, nonsense. I’ve summarized the situation below as based on his three posts. In short, the state ordered the district to dismiss a good number of its teachers as per their VAM scores when this school year started. “[T]his has been Florida’s [educational reform] model for nearly 20 years [actually since 1979, so 35 years]: Choose. Test. Punish. Stigmatize. Segregate. Turnover.” Because the district already had a massive teacher shortage as well, however, these teachers were replaced with Kelly Services contracted substitute teachers. Thereafter, district leaders decided that this was not “a good thing,” and they decided that administrators and “coaches” would temporarily replace the substitute teachers to make the situation “better.” While, of course, the substitutes’ replacements did not have VAM scores themselve, they were nonetheless deemed fit to teach and clearly more fit to teach than the teachers who were terminated as based on their VAM scores. Consequently, this has turned into a “chaotic reality for real kids and adults” throughout the county’s schools, and the district and state apparently realized this by “threaten[ing] all of [the district’s] teachers with some sort of ethics violation if they talk about what’s happening” throughout the district. While “[t]he repetition of stories that sound just like this from [the districts’] schools is numbing and heartbreaking at the same time,” the state, district, and school board, apparently, “has no interest” in such stories. Isn’t that the unfortunate truth; hence, and with reference to the introduction above, please do keep these relatively more invisible studies coming so that we can share out with the nation and make such stories more visible and accessible. VAMs, again, are alive and well, just perhaps in more undisclosed ways, like within districts as is the case here. For those of you interested, and perhaps close to Houston, Texas, I will be presenting my research on the Houston Independent School District’s (now hopefully past) use of the Education Value-Added Assessment System for more high-stakes, teacher-level consequences than anywhere else in the nation. As you may recall from prior posts (see, for example, here, here, and here), seven teachers in the disrict, with the support of the Houston Federation of Teachers (HFT), are taking the district to federal court over how their value-added scores are/were being used, and allegedly abused. The case, Houston Federation of Teachers, et al. v. Houston ISD, is still ongoing; although, also as per a prior post, the school board just this past June, in a 3:3 split vote, elected to no longer pay an annual $680K to SAS Institute Inc. to calculate the district’s EVAAS estimates. Hence, by non-renewing this contract it appears, at least for the time being, that the district is free from its prior history using the EVAAS for high-stakes accountability. See also this post here for an analysis of Houston’s test scores post EVAAS implementation, as compared to other districts in the state of Texas. Apparently, all of the time and energy invested did not pay off for the district, or more importantly its teachers and students located within its boundaries. As mentioned, I will be speaking, alongside two featured speakers: Samuel Abrams–the Director of the National Center for the Study of Privatization in Education (NCSPE) and an instructor in Columbia’s Teachers College, and Julian Vasquez Heilig–Professor of Educational Leadership and Policy Studies at California State Sacramento and creator of the blog Cloaking Inequality. For more information about these and other speakers, many of whom are practitioners, see the conference website available, again, here. When is it? Friday, October 14, 2016 at 4:00 PM through to Saturday, October 15, 2016 at 8:00 PM (CDT). Why So Silent? Did You Think I Have Left You for Good? You might recognize the title of this post from one of my all time favorite Broadway shoes: The Phantom Of The Opera – Masquerade/Why So Silent. I thought I would use it here, to explain my recent and notable silence on the topic of value-added models (VAMs). First, I recently returned from summer break, although I still occasionally released blog posts when important events related to VAMs and their (ab)uses for teacher evaluation purposes occurred. More importantly, though, the frequency with which said important events have happened has, relatively, fortunately, and significantly declined. Yes — the so-far-so-good news is that schools, school districts, and states are apparently not as nearly active, or actively pursuing the use of VAMs for stronger teacher accountability purposes for educational reform. Likewise, schools, school districts, and states are not as nearly prone to make really silly (and stupid) decisions with these models, especially without the research supporting such decisions. This is very much due to the federal government’s recent (January 1, 2016) passage of the Every Student Succeeds Act (ESSA) that no longer requires teachers to be evaluated by their student’s tests score, for example, using VAMs (see prior posts on this here and here). While there are still states, districts, and schools that are still moving forward with VAMs and their original high-stakes teacher evaluation plans as largely based on VAMs (e.g., New Mexico, Tennessee, Texas), many others have really begun to rethink the importance and vitality of VAMs as part of their teacher evaluation systems for educational reform (e.g., Alabam, Georgia, Oklahoma). This, of course, is primary at the state level. Certainly, there are districts out there representing both sides of the same continuum. Accordingly, however, I have had multiple conversations with colleagues and others regarding what I might do with this blog should people stop seriously investing and riding their teacher/educational reform efforts on VAMs. While I don’t think that this will ever happen, there is honestly nothing I would like more (as an academic) than to close this blog down, should educational policymakers, politicians, philanthropists, and others focus on new and entirely different, non-Draconian ways to reform America’s public schools. We shall see how it goes. For those of you who might recall, just over two years ago my book titled “Rethinking Value-Added Models in Education: Critical Perspectives on Tests and Assessment-Based Accountability,” was officially released by my publisher – Routledge, New York. The book has since been reviewed twice – once by Rachael Gabriel, an Assistant Professor at the University of Connecticut, in Education Review: A Multilingual Journal of Book Reviews (click here for the full review), and another time by Lauren Bryant, Research Scholar at North Carolina State University, in Teachers College Record (although the full review is no longer available for free). It was just reviewed again, this time by Natalia Guzman, a doctoral student at the University of Maryland. This review was published, as well, in Education Review: A Multilingual Journal of Book Reviews (click here for the full review). Here are some of the highlights and key sections, especially important for those of you who might have not yet read the book, or know others who should. know about VAMs in the American public education system. The author contextualizes her critique to added-value methods in education within a larger socio-political discussion that revisits the history and evolution of teacher accountability in the US. The book incorporates studies from academic sources as well as summarizes cases from popular outlets such as newspapers and blogs. Thanks go out to Natalia for such a great review, and also effectively summarizing what she sees (and others have also seen) as the “value-added” in this book.